What Are Tuners and How Do They Work? Tuners are hardware that take the Over-the-Air TV signals coming in from your antenna and turns them into video. Like all OTA DVRs, Tablo divides the signal from your antenna between either two or four tuners depending on the model. The additional tuners allow your Tablo DVR to decode video from more than one OTA TV channel at the same time, unlike your television which only includes a single tuner. It’s worth noting that despite the in-line amplifier contained in every Tablo OTA DVR, dividing the signal between multiple tuners can reduce your overall signal strength. If you have marginal reception on some of your channels, you may wish to improve your antenna reception before you purchase an OTA DVR. Although it might be tempting to save some cash and immediately go for a dual-tuner Tablo DVR, we've heard time and time again from customers that those extra two tuners come in handy more often than they thought! A tuner is required for each live TV or recording stream. A dual-tuner Tablo will let you watch live TV from two different channels at once or record two different channels at once. With a 4-Tuner you can watch or record up to four different TV channels simultaneously. As broadcasters increasingly schedule the most popular TV shows in competing timeslots – like Thursdays at 8 p.m. – the more likely you’ll create recording conflicts with a dual-tuner device. Those who are lucky enough to receive a lot of channels via an Over-the-Air TV antenna may also have to make tough decisions about which favorite show or sporting event gets recorded or not, based on how many tuners are available. If you attempt to view more concurrent Live TV streams than you have tuners available, your Tablo app will show a 'No Tuner Available' error message. If you attempt to schedule more concurrent recordings than you have tuners available, your Tablo app will show a red conflict flag. If you wish to record the airing with the conflict, you must unschedule one of the competing airings in the same time slot. Worth noting – Watching a previously recorded show does NOT require a tuner, unless you’re away from your Tablo’s home network. More on that below. One of the great things about a networked DVR like Tablo is that you can watch TV on a wide variety of supported devices, instead of a single connected television. That means with a dual-tuner Tablo DVR you can watch the game live in the family room, while someone else watches the latest episode of their favorite sitcom upstairs. 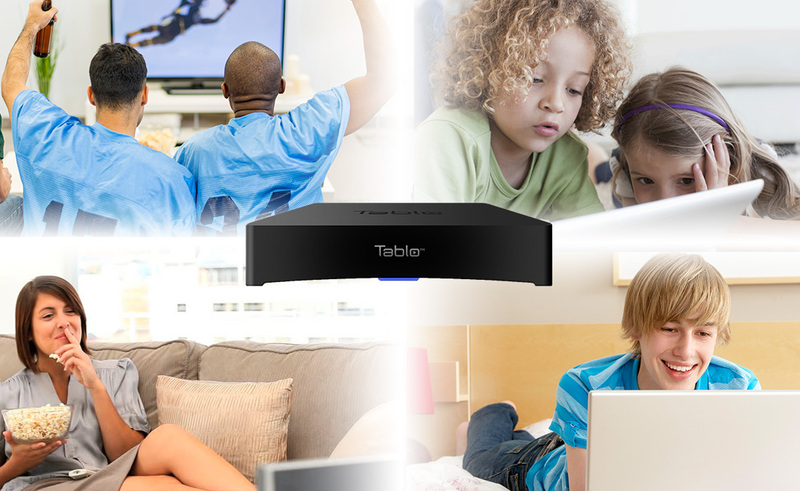 With a 4-Tuner Tablo, you can watch the game and the sitcom live, while recording two other shows. If you have a big household – especially if your family includes teenagers or grandparents - you’ll want a 4-Tuner Tablo DVR. Overlapping schedules, viewing habits and conflicting interests make it more likely you’ll need more than two concurrent live TV streams or recordings to keep the gang happy and entertained. One of the Tablo DVR’s most-loved features is the fast forward preview thumbnails available on completed recordings. Fast-forward previews make it easy to see where commercials start and stop so you can skip them in a snap. However, creating those thumbnails requires an available tuner at the end of the recording, so although recordings are processed one at a time, having an extra tuner available for processing will come in handy to those who are impatient. The other advantage of a network-based DVR like Tablo is that you can watch live TV or recordings from your hometown anywhere in the world using Tablo Connect. Unlike viewing on your Tablo’s home network, viewing previously completed recordings DOES require a tuner unless your remote streaming quality is set to ‘full’, so having a few extra tuners to record while streaming remotely can come in handy for snowbirds and business travelers alike. And a caveat… For the 4-Tuner Tablo ONLY when using the highest recording quality (HD 1080, 720 @ 60fps) Tablo’s fourth tuner will be temporarily disabled if any 720p stations are currently being watched or recorded at 60 fps. This is due to the high processing requirements of this setting. You can read more about that on our Knowledge Base. TLDR: If you love primetime shows, have a sports fan in the household, have a large household, or if you can receive more than 30 channels using a TV antenna, you should seriously consider the 4-Tuner Tablo OTA DVR, or you might wind up singing the ‘lack of tuners’ blues. Tablo FAQs – Why Don’t I Always See Fast Forward Preview Thumbnails on Tablo?